This iExpression replaces the source text of a text layer by a randomly generated text that continuously runs from left to right or from right to left. Different kinds of text can be generated, e.g. binary numbers, numbers, or random strings using the letters of the alphabet. 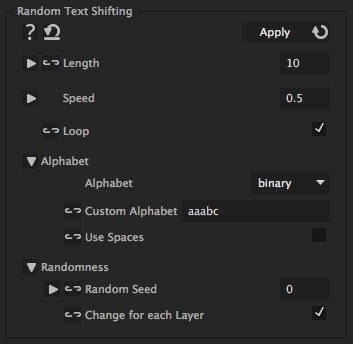 The random text can also change over time such that every few frames a new random text is generated. How many letters the string should run every frame. For negative numbers the text runs in the other direction. Those characters are used, when the alphabet 'Custom' is choosen. If letters occur more than once in the alphabet, they are used more frequently, e.g. for 'aaabc' the letter 'a' occurs 3 times as often in the random text as 'b' or 'c'. With this option the generated text also contains empty spaces. Change this number arbitrarily to get another random text. For each number a different random text is generated.